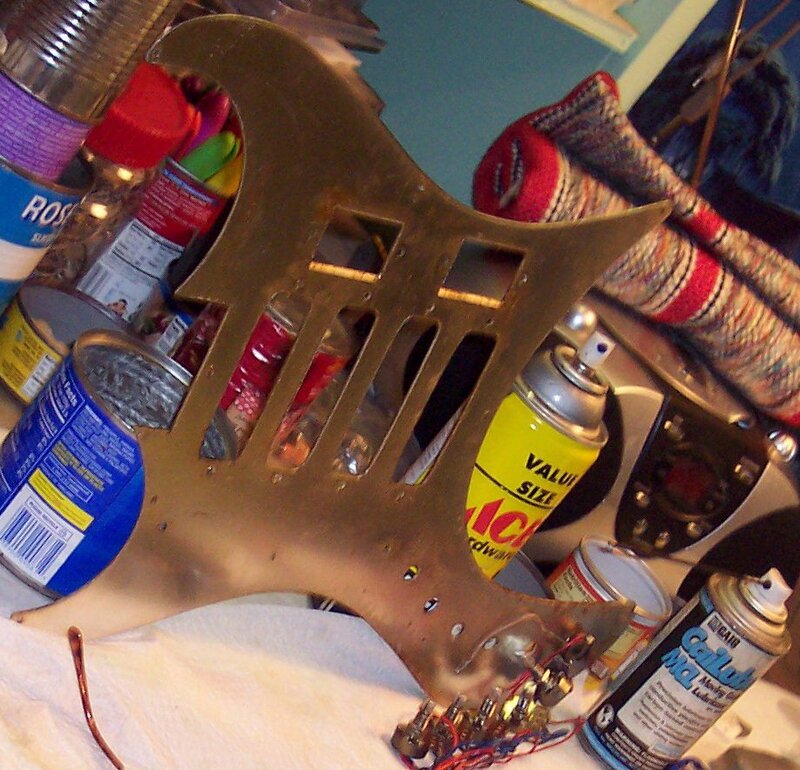 In the picture above some of the corrosion on the back side of the pickguard can be seen. It's since been scrubbed off and coated with a thin wiped-off film of Ace Lub-E to help protect it's future. ~~~~~~~ The can of CaiLube MCL is the potentiometer and electronic contact de-oxidizer / cleaner / lubricant that I use. A number of other cheaper contact cleaners will destroy the carbon race of potentiometers. The pickguard corrosion can be seen better in this view below. 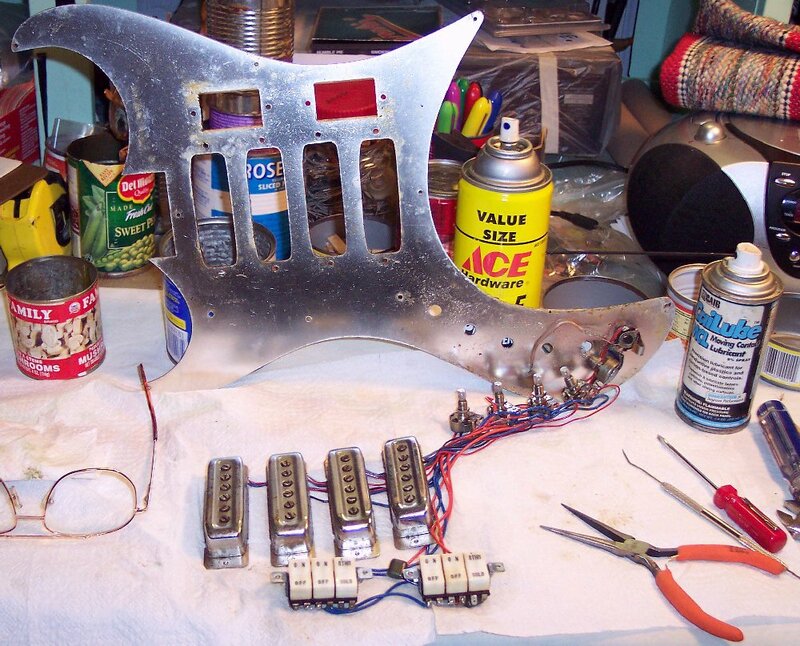 Although it was nominal, it occurs at the points where electronic parts are attached and thus communicate with the case-ground shielding plate the pickguard serves as. 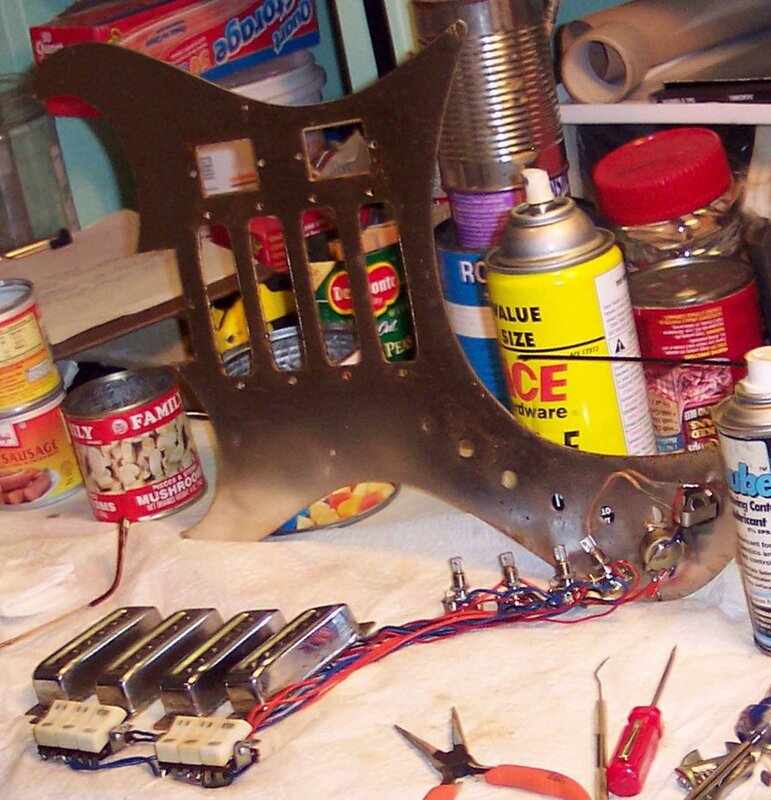 The electronic harness is laid out on this page to generally show how the harness is laid out to fit onto the pickguard and into the guitar's body cavity. Several views have been provided should they be helpful in future work-planning while the guitar is assembled. Although Japanese guitars used to be the low-end inexpensive guitars, ....as such they had a mostly unwarranted reputation for being cheaply made; But the parts of this guitar (and other Japanese guitars from this period) are of remarkably good consumer-grade quality. But because the electric guitar did not gain mass popularity in Japan and thus Players influence upon their designs until the early 1970's; Japanese guitar design philosophy just hadn't caught up with public-favored USA designs yet, ...and historic Japanese pride was actually trying to compete with western countries' designs. This guitar's quality and it's sophisticated circuit logic are good examples that the Japanese designers were by no means asleep at the wheel; They were just a bit too protective of older Japanese pride and design philosophies. But many European guitars of the same period also hadn't yet caught up to the mass popularity of electric guitars, favored their own designs and thus hadn't yet provided what Players world-wide defined as design refinements needed of all manufacturers. Most Folks who grew up around REAL Blues and Carribean influences understand what Mojo means; Quite the same as American Indian Medicine bags and objects. So it's only appropriate that my shop has a number of Mojos and Medicine bags / objects. And shown below are the "Sticks and Stems" mojo gang watching over my work to make sure it's all done properly (especially them two on the left-end making sure the oil lamp ain't about to be lit ! ). 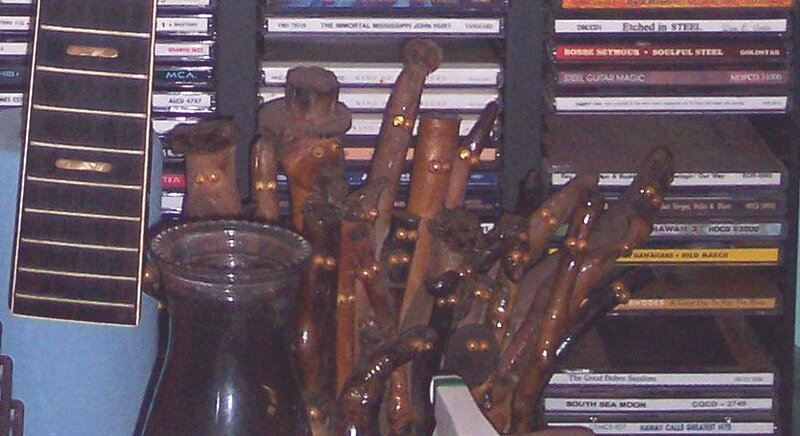 Each stick washed up on the beach, and during my beach-combing made themselves seen waiting to join the gang ! All they needed was a pair of plastic eyes to watch over things !